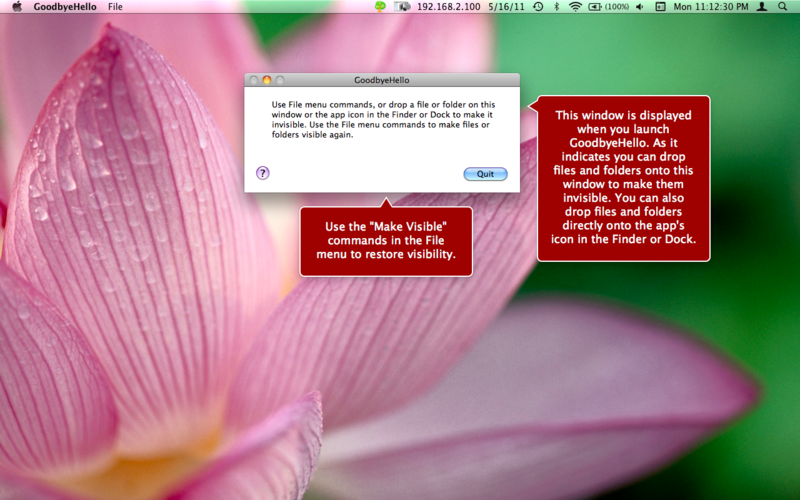 GoodbyeHello is an app for making files and folders invisible or visible. When you drop a file or folder on the app's main window, or Finder or Dock icon, it will be made invisible. You can also use the File menu commands "Make Files Invisible..." or "Make Folder Invisible..." to make files or folders invisible. You can also use the File menu command "Make Path Visible..." to make a file or folder visible. This command requires you to enter the pathname of the file or folder. Note that pathnames of processed files and folders are logged to the console. You can open the console by selecting "Open Console..." from the File menu. The log is useful for copying file and folder pathnames into the "Make Path Visible" window's text field. You can also navigate to the files you want to make visible using the "Make Files Visible" File menu command, and navigate to the folder you want to make visible using the "Make Folder Visible" File menu command. Both navigation dialogs will display invisible files.